Argyle Open is an online video slot machine game released in July 2010 and it is offered exclusively at online casinos powered by Microgaming. This video slot game has 5 reels and 40 pay lines. The theme of Argyle Open is all about the precision club and ball sport known as golf. Get your golf shoes ready and compete at an exciting golf tournament here at Argyle Open, where you get to play some good old fashion golf game inside a fun slots machine game! In this particular slot game, players will never have to worry about bad weather, as it’s always sunny in this game. The symbols used in this game are all related to golf which includes professional golfers, shoes, tees, trophies and flags – the perfect symbol choices for golf players and enthusiasts. Another thing that a lot of online slot players love about this game is that it has a very lucrative payout amount, that is, you can win up to 20,000 in the main Argyle Open slot game if you wager the maximum bet amount! It can even become a massive 100,000 prize in the Free Spin Bonus Feature game! The Argyle Open online slot game will certainly provide you hours of fun and entertaining slot action, and the opportunity to win significant rewards while enjoying a game of golf with friends. Microgaming online slot games are available to players in 2 formats – download and no-download. Whether you like to download their software first or you prefer to play instantly without the need to download, then Microgaming surely has online slot machine games to accommodate your every slot gaming preference. Argyle Open is a slot game that belongs to the download category, which means you must download first before you are able to play this particular slot game. Argyle Open is created for those who both like golf and slot machine games, and at the same time for those who wish to win some real money while enjoying a round of spins in this light and fun slot game. The Argyle Open online video slot game features scatter wins, Stacked wild symbols, Free Spins, multipliers, a 3-stage Golf Tournament Bonus Feature game, a maximum jackpot of 20,000 in the main game and a maximum jackpot of 100,000 in the Free Spin Bonus Feature game! The quality of the graphics and sound that Microgaming provides is absolutely splendid and outstanding. They have a solid reputation of making the most stunning graphics and realistic sound effects that will truly transport you to “that specific theme” they use in any of their slot games. Most people love to play games incorporated with Microgaming software because they have smooth animation and engaging yet non-interfering sounds. 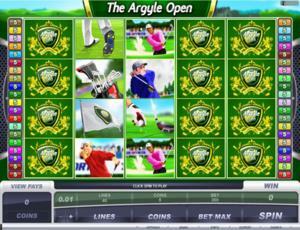 In the Argyle Open online slot game, players are brought to a popular, lush green golf course, where people who love this outdoor sport are competing against each other in an exciting golf tournament. The symbols are drawn in a rough 2D manner, and the main backdrop of the symbols is green, the perfect color that is guaranteed not to strain your eyes and it also matches the theme of the game as well. Simple yet appropriate animated programming is used on the symbols when you successfully hit winning combinations. The overall graphic design of Argyle Open showcases a classic yet fun golf tournament game, complete with golf balls, trophies, golf clubs and the vibrant green golf course just behind the reels. Colors used in this particular slot game include purple, red, blue, pink, yellow, gold, silver, black, white, and a whole lot of green! Since this is an outdoor-themed slot game, when you spin the reels, the usual background music you will hear is somewhat nature-themed, with piano music as well as birds singing and chirping. When you manage to form winning combinations, “shimmering” celebratory music will be played out as you get paid. In the Golf Tournament Bonus Feature game, you will hear exactly what you hear in real golf tournaments on TV. You will hear a commentator reporting your moves or the game play while the sounds of clapping and cheering can be heard from the audience as they witness your great tee off performance. There are no card deck symbols available in the Argyle Open online video slot game. The regular symbols that you will find in Argyle Open are the Trophy, Win, Chip, Line Up, Drive, Standing, Tee Off, Golf Shoes, Clubs and the Flag. The Wild Symbol is the Argyle Open Logo symbol. It acts as a substitute for all other symbols (except for the scatter symbol) in order to help you complete a winning combination. The Argyle Open Logo wild symbol can be found on all 5 reels, and they can appear Stacked. It is entirely possible for you to get up to 4 Argyle Open Logo wild symbols to come out on a reel at the same time, which makes up an Argyle Open Logo wild symbol Stack. Stacks mean you have more chances of winning as they can substitute for other symbols to help you complete winning combinations. You are paid varying prize amounts (refer to the Payout table) when you manage to form a winning combination with multiple Argyle Open Logo wild symbols on an enabled pay line. The Scatter Symbol is the Golf Ball. The scatter symbol is not required to appear in a line (on an enabled pay line) for you to win. The Golf Ball scatter symbol can be found scattered anywhere on the 5 reels, and you are able to form winning combinations as long as there are 2 or more Golf Ball scatter symbols that appear. Your winnings are calculated by multiplying the Golf Ball scatter symbol combination payout (refer to the Payout table) by the total number of coins you’ve bet. If you managed to get 3 or more Golf Ball scatter symbols (found anywhere on the 5 reels), you will trigger the Golf Tournament Bonus Feature game. Please take note that if you get a scatter win and a normal win, then you are paid out for both of these wins, because the Golf Ball scatter symbol is not required to come out on an enabled pay line for you to win. Scatter awards are independent from pay line awards, and thus they are added to the pay line win. If you manage to get 3 or more Golf Ball scatter symbols (found anywhere on the 5 reels), you will trigger the Golf Tournament Bonus Feature game. All throughout the Golf Tournament Bonus Feature game, you’ll win random bonus prize amounts, along with up to 20 Free Spins in the Golf Tournament Bonus Feature game. The Golf Tournament Bonus Feature game consists of 3 stages. Each stage has a different type of Golf Tournament Bonus Feature game. Only 1 stage can be played out when the Golf Tournament Bonus Feature game is triggered. Hence, when you have finished playing a stage, the Golf Tournament Bonus Feature game will end. When the Golf Tournament Bonus Feature game is triggered again, you will be playing the next stage. You are given the freedom to choose from 1 of 5 pro golfers: Blake Connor, Kevin Andrews, Wayne Philips, Ryan Smith and Mark Winston. One of them will play a hole for you on your designated course. On every Golf Tournament Bonus Feature game, the player you choose will find himself taking the next stroke of the hole. Click Start to tee off and play out each stroke with a different golf club to play your way towards the Green, via the Fairway, prior to sinking the Putt to reveal your Free Spin awards. In the Drive and Fairway Bonus Features, you will be rewarded generous bonus prize amounts for the distance traveled by the golf ball when it was shot. In the Putt Bonus Feature, the closer you get to the hole, the more number of Free Spins you will win! You can win 10, 15 or 20 Free Spins, with a multiplier value of 2x, 3x, or up to 4x! If the putt is sunk in 1 shot only, you get a special award of 20 Free Spins at a 5x multiplier! You can also get extra Free Spins if you manage to get 3 or more Golf Ball scatter symbols found anywhere on the reels while playing the Free Spins. The extra Free Spins you get are included to your remaining amount of Free Spins. You can win an infinite amount of extra Free Spins while playing the Free Spin Bonus Feature game. Since the Golf Ball symbol is a scatter symbol, your wins are calculated by multiplying the Golf Ball symbol combination payout (refer to the payout table) by the total amount of coins you’ve bet. When the Free Spin Bonus Feature game is over, you will be then taken back to the main Argyle Open online slot game, and your winnings from the Free Spins will be included to your overall balance. When you trigger the Golf Tournament Bonus Feature game for the first time, you will be playing this stage. A bonus prize amount is awarded to you in this bonus feature. To start off the game, you are to choose 1 from 5 golfers. Then, a wheel with 4 Wood golf clubs is shown, marked 1W to 4W. Click on the Start button. The 4 golf clubs on the wheel will be highlighted in sequence and will randomly stop on one. The golfer you chose will then tee off with the randomly chosen golf club. The bonus prize amount you will win is dependent on the distance obtained by the shot played out by your golfer. The further the distance obtained, the higher your bonus prize amount. Please note that the bonus prize you get in the Drive Bonus Feature is already multiplied by the amount of coins you’ve bet and the number of pay lines activated. When the Drive Bonus Feature game is over, you are taken back to the main Argyle Open slot game, and your bonus prize is added to your overall balance. When you trigger the Golf Tournament Bonus Feature game for the next time, you will be playing this stage. A bonus prize amount is awarded to you in this bonus feature. A wheel with 4 Iron golf clubs is shown, marked 6i to 9i. Click on the Start button. The 4 golf clubs on the wheel will be highlighted in sequence and will randomly stop on one. The golfer you previously chose will then tee off with the randomly chosen golf club. The bonus prize amount you will win is dependent on the distance obtained by the shot played out by your golfer. The nearer the golf ball is from the pin, the higher your bonus prize amount. Please note that the bonus prize you get in the Fairway Bonus Feature is already multiplied by the amount of coins you’ve bet and the number of pay lines activated. When the Fairway Bonus Feature game is over, you are taken back to the main Argyle Open slot game, and your bonus prize is added to your overall balance. Up to 20 Free Spins with up to 5x multiplier can be won in the Putt Bonus Feature. This is the last Bonus Feature in the Golf Tournament Bonus Feature game. A wheel with 3 Wedge golf club selections is shown: the Lob or Loft Wedge (LW), the Pitching Wedge (PW), and the Sand Wedge (SW). Choose one of them. The golfer you previously chose will then try to putt the ball with the chosen club. If your golfer successfully putts the ball in one shot, you win 20 Free Spins plus all of these Free Spins will be carrying a 5x multiplier. If your golfer fails to putt the ball in one shot, you can win 10, 15, or 20 Free Spins, depending on the nearness of the ball from the hole. After that, your golfer will play a second shot to putt the ball. A random multiplier amount of 2x, 3x, or 4x is shown, and all of the wins during your Free Spins will be multiplied by the amount you will get. When the Putt Bonus Feature game is over, you are taken back to the main Argyle Open slot game, and the Free Spins you’ve won will be automatically played out. In case another 3 or more Golf Ball scatter symbols (found anywhere on the reels) are formed while playing a Free Spin, you will win the same amount of Free Spins as you originally got. The current multiplier amount will still be in effect. The extra Free Spins are then included to your remaining amount of Free Spins. You can win an infinite amount of extra Free Spins while playing the Free Spin Bonus Feature game. Please note that while playing the Free Spin Bonus Feature game, it is possible for you to get up to 4 Argyle Open Logo wild symbols to come out on a reel at the same time, which makes up an Argyle Open Logo wild symbol Stack. Stacks mean you have more chances of winning as they can substitute for other symbols to help you complete winning combinations. Also, since the Golf Ball symbol is a scatter symbol, your winnings are calculated by multiplying the Golf Ball scatter symbol combination payout (refer to the Payout table) by the total number of coins you’ve bet. When the Free Spins are all used up, you are then taken back to the main Argyle Open online slot game, and your Free Spin winnings are included to your overall balance. Argyle Open has 5 reels where you may bet on as many as 40 pay lines. The minimum bet is 0.01 and the maximum bet is 0.50 per pay line. You can wager 1 up to 10 coins per pay line bet. Therefore, the maximum bet amount is 200.00 per spin. The maximum payout in the main Argyle Open online video slot game is 1,000 coins per line bet. People who often play online casino games apparently love to stay and play longer on online slot games that have an Autoplay function. Good thing that Argyle Open comes with this function! In Microgaming online slot games, they have 2 game modes – Regular mode and Expert mode. You can have the game spin automatically for you with the Autoplay function that can be found by clicking the Expert button (located at the lower left portion of the game screen). After customizing the Autoplay function to your preferences, just click on the Start button, and the game will automatically spin for you while you just sit back, relax, and enjoy playing this exciting golf-themed online video slot game!